In many occasions, applying moisturizing hair products isn’t enough to add moisture and shine to people’s locks. This is where the best hair steamer proves to be necessary. With their ability to directly add moisture to your tresses, they offer a more efficient and effective job in beautifying and improving your locks’ health. Not familiar with hair steamers? Let this guide teach you everything you need to know about these hair devices and help you choose which would be the best pick for you. Even if you’ve never really seen a hair steamer before, it’s quite easy to understand what it is. As its name suggests, it’s a device that produces steam that you can use for your hair. It’s a rather simple and straightforward piece of electronics that you can easily compare with a clothes steamer. Why would you need one? Steaming hair offers a lot of great benefits. As mentioned above, it’s an excellent way to introduce moisture to one’s locks. This is why these beauty tools are widely popular among those with natural hair. It’s a fact that very curly locks are prone to dryness. Due to the strand’s shape, the natural oils don’t often get to travel down the hair shaft. As a result, curly hair hardly ever gets enough moisture to stay healthy and strong. Steamers for hair are said to help lift up the cuticles to deliver moisture directly into the hair shaft. This ensures that your hair will get hydrated and moisturized. It’s also said to help improve the elasticity of hair strands and keep the hair color vibrant. For some experts, hair steaming is also beneficial because the heat stimulates blood flow to the scalp. As a result, it encourages hair growth. Others also say that regular steam treatments for hair can help preserve certain hairstyles. They’re also said to help in fighting frizz, so this hair care method can really be a great addition to a lot of people’s routines. If you’ll ask some of the most loyal users of these devices, however, they’ll tell you that they use hair steamers to add moisture and define their curls. These are already enough to motivate the hair industry to develop better steamers so they can better assist their customers in their beauty needs. With all of these benefits, it also makes sense that you’re trying to get to know these devices better. They might just be the very solution to your hair woes. 1. There are a few different types of hair steamers that you can choose from. Commonly used for hot oil treatments in salons, stand up steamers are some of the most popular options for hair steamers. They resemble floor lamps but instead of having a lightbulb under its shade, it has a steam outlet. They’re convenient picks as they often have a wide range of features and settings that make them quite versatile as well. However, they can take up quite a good amount of space so not everyone finds them the perfect pick for home use. They’re also often called hooded steamers, although, such products can also come in tabletop formats. These steamers are more popular among home users since they’re easier to store and lug around. They also come in different formats so you also have a choice at how convenient you want your home use unit to be. If you’re not entirely sure you want to invest in a hair steamer yet but you want to give the method a try, steamer caps are great options. They’re usually made to be used with a hair blower so they come in very friendly price points. As we also recommend using your best blow dryer to dry your hair after steaming, these options may also work as practical options for many. However, you can also opt for some units that come with their own heating elements. They can be more convenient options, especially if you want to avoid issues in the connection of the hair steamer cap and blow dryer. There are also some handheld hair steaming devices that work wonders as portable hair steamers. They’re a lot similar to hair blowers as they are used the same way. To use these items, you’ll need to hold up the device to your hair to deliver the steam to your locks. It can be quite tiring since you’ll have to spend a few minutes fiddling with your hair using the device but it also comes with some benefits. You should weigh your options carefully, though, as this can be a deal breaker for some users. If you don’t have the space for standing hair steamers but would like to have a convenient, hands-free hair device, these are solid choices for you. They can be trickier to use at home but if you intend to get a matching chair and a professional tabletop unit, you can still be guaranteed ease of use. 2. All hair types will benefit from hair steaming. While these devices are widely used by folks with natural hair, other hair types - fine, coarse, or normal - can also benefit from the best hair steamer. 3. You still have to take precautions in using a hair steamer. Due to the high levels of heat involved in the process, you should make sure to go about the procedure carefully. Follow the instructions in how to DIY steam your hair to the dot so you can be sure that your hair and skin won’t get heat damage. 4. Choosing the right hair steamer for you can be tricky. The best hair steamer for you will always be the one you’ll end up using regularly. And to ensure that you’ll do just that, you should choose a unit that is convenient for you to use. It should suit your lifestyle, preferences, and home so you won’t feel hassled to use your unit. Hair steamers are definitely not made equally. You’ll find units with the most basic functionalities but you’ll also encounter some that come with all the bells and whistles you can expect in a beauty device. This is why you should also consider the capabilities of the unit you’re eyeing. Do you want it to have adjustable temperature settings? Do you want it to double as a facial steamer? Do you just want a basic hair steamer? Get to terms with your wants and needs and you can be sure to find a suitable match. You should never compromise quality when it comes to hair steamers. As it comes with a heating element, it can prove to be a dangerous device if it doesn’t come with high-quality materials and construction. So make sure that your unit is sturdy and durable at the very least. Hair steamers also come in different price points so you might want to look for something good that is also within your budget. Experts always say to buy the best product that you can afford and it should also apply to these devices. Even though the price tag isn’t always an indicator of quality, when you combine everything listed above with your budget, you might really end up with a great pick. The next thing that you should know about if you want beautifully steamed hair is which products are the best options for you. For this, we’ve rounded up six of what a lot of users today consider as the best hair steamers. Check them out below. For a reliable professional hair steamer, the Best Choice Products Commercial Hair Steamer Equipment Color Process Machine would be a good option. This is a professional-grade hair steamer hairdressing appliance that you can use both at a salon or at home. So if you’re ready to invest in your hair health, this might just be, as its brand name suggests, the best choice for you. One look at this hair steamer and you’ll know that it has a lot to offer. Its professional appearance is really impressive, for starters. It doesn’t look flimsy at all, so it’s certainly worth considering. It has a lot to brag in terms of construction as well. For starters, it’s durably built. So it doesn’t just look nice but it also feels solid as well. Paired with its adjustable height, you can be sure that different users won’t have a hard time using it. Another thing to note about this product is its steam hair oiling mechanism. This makes it more versatile as hair oiling helps nourish the hair further. This means that you can also use oil to further moisturize and improve the quality and health of your tresses. Its low noise is another great feature it has to offer. Heat styling appliances can get noisy so this will let you enjoy some peace and quiet while you pamper yourself. It can certainly be a great tool to have if you love to care for yourself during your me-time. As one would expect from a pro-grade hair tool, this product also comes with adjustable features. You can control the wind and heat velocity of the steam and the amount of steam gushing out of the hood to customize your steaming session. You can also set its timer from 0 to 60 minutes and control when it will automatically shut off to complete your session. The only downside is that it doesn’t seem to have a foolproof way to deal with condensation. Users note that they experience hot water dripping from the hood so it’s recommended to wear a towel around your neck to avoid injuries. If you want to get the most out of your hair steamer, then the Red Pro Hair Therapy Steamer might just tickle your fancy. You can use this tabletop unit not just for your tresses but for your face as well so it might just give you a good run for your money. Yes, you’ve read that right. This is not just a steamer for hair. It’s also a facial steamer. This is why it’s also called the 2-in-1 Hair & Facial Steamer because it can be the ultimate beauty steaming device for home use. How is this possible? Its attachments are interchangeable so you can easily switch from steaming your hair to steaming your face. You’ll need to use two attachments to hold the hood in place for hair steaming than you have to remove both and switch it to the facial steamer to use it as such. As a hooded steamer, however, you have to place it on a rather high surface or find a lower chair to go under the hood. The attachments are not adjustable in height, so you’ll need to make manual adjustments in other aspects. Aside from this, however, it does a great job in infusing moisture to your tresses. Its hood is nicely designed so you can set it to direct and release your desired amount of mist. You can lessen or increase the fog mist by just turning the vent cap above the hood, making the unit very easy to operate. The hood also has its own drainage system. The edge of the hood is lined with a gutter-like part that helps catch condensation. This ensures that you won’t get scalded by dripping hot water and that you can always steam your tresses comfortably. Operating this item is also very simple. You only have two buttons to press and that’s pretty much it. One’s to turn it on and off and the other is for the ozone switch that you also need to turn on before using the unit. Aside from its 2-in-1 design, this item is also very convenient to use. It has an automatic shut off timer to keep you from over steaming your locks. It shuts off after about 20 to 25 minutes so you don’t have to watch the clock while you steam your hair. It also has a water level alarm that buzzes when the water levels are too low. This should prompt you to turn off the unit, however, as it can be dangerous to refill the tank while the unit is in operation. As it’s also quite hard to put water inside its tank, you might need to let the unit cool down first before refilling it. Like the item listed above, the Secura S-192 Hair and Facial Steamer is also a 2-in-1 beauty device. It can also steam your face and hair so you’ll get two functionalities for the price of one. It’s a nice alternative choice for the Red Pro product above, so if you want more options for a multi-functional appliance, you should add this to your list. The Secure S-192 shares a lot of things in common with the Red Pro hair steamer above so you can expect to be torn between the two. You’ll also only need to switch attachments to use this unit for your hair and your face. It also only has two switches for controls, making it very easy to work with. The hood design of the two is also similar. You can easily adjust the amount of steam directed to your hair by turning the vent cap. There’s also a handy condensation catcher on its rim so you don’t have to get scalded by hot water dripping down from the steam outlet. What sets them apart, however, is the fineness of the mist that they release. The Secura S-192 generates 1-5 um ultra-fine mist. This is why it touts itself to be highly effective in moisturizing the hair and face as its steam is easily absorbed by the pores and hair cuticles. Aside from its hair and skin care functionalities, some users also say that this unit can function as an interior humidifier as well. Its hot mist can even help warm up a room, making it a nice appliance to have around during the freezing months. Note, however, that like the Red Pro, this item’s hood is not adjustable in height. So you’ll also need to perch it on a higher surface if you don’t want to squeeze under its hood. 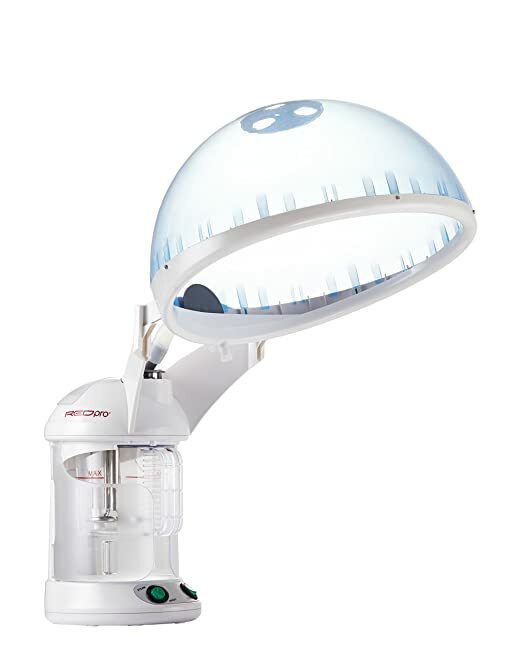 Starting off our list is the Mefeir Upgraded 600W Hair Steamer Machine with Hood. This stand up steamer is designed to be used for conditioning, priming, and dyeing, making it a versatile pick for salons and home users alike. As it is designed to be used in salons, it shouldn’t be surprising that this product has a lot to offer. For starters, with its 600W capacity, it’s certainly powerful enough to create different steaming settings that will benefit your hair. This powers up its two settings for its fog mist. One offers the regular amount of fog mist while setting 2 offers more. These functions will let you customize how effectively your hair can soak in the steam and moisture. Another adjustable feature of this product is its height. It’s very easy to adjust its standing height so you can always easily fit under the hood. This makes it a great choice for salons and an attractive pick for households who will share a single unit to care for their tresses. Completing its functional design is its 30-minute timer. As you’re only supposed to steam your hair for 15 to 30 minutes if you want to do it safely, this product’s timer can help ensure that you won’t over-steam your tresses. A lot of people might feel compelled to do so, especially after getting good results. This can prove to be too much for your hair, though, so experts strongly recommend against it. Aside from its functionality, its construction is also noteworthy. The manufacturer made sure that it’s safe to have around with the help of its leak-proof design. This makes sure that the hot water won’t get out of its container and hurt you and other people near the appliance while it’s in use. It also has a handy waste water cup. This helps ensure that you’ll only use clean water on your tresses and that you can handle waste water efficiently. You’ll be able to remove such with ease (after letting it cool down, of course). Its design is also said to help prevent mineral buildup inside the water container. This will help guarantee that the hair steamer will continue to perform at its top shape even if you live in a hard water area. It also has a four-foot base design that is made to be balanced and sturdy. It also helps simplify the unit’s assembly. However, some people find it tricky to set up. In some occasions, they find it quite flimsy when not tightened the right way. So you might need to test it out first before completely attaching the hood and the unit’s electric components. Those who are after an affordable standing hair steamer should check out the Skin Act Deluxe Hair Steamer with Timer. This product comes as a good lower-priced option among its competitors since it also comes with a 650W motor. While it’s not as customizable as the Best Choice Products item listed above, this hair steamer is still a solid choice for its adjustable steam power. You can adjust the amount of steam with the flick of a switch. It also has an adjustable timer so you can set the duration of your steaming session from 0 to 60 minutes. It will then automatically shut off when the time is up. Its vented hood also further helps you adjust the amount of steam that your hair will receive. You can turn it close or open so you can easily regulate the flow of the stream. If you’re worried about the unit’s stability because of its friendly price tag, don’t fret. It comes with a composite base with five feet so it’s guaranteed to be balanced and sturdy. You don’t have to worry about it tipping over, especially while in use. The Q-Redew Hand-held Hair Steamer is possibly the most popular hair steamer for natural hair today. You’ll find tons of curly-haired beauty gurus, enthusiasts, and industry experts recommending this item for its effectiveness, especially for very curly locks. It should be noted, however, that this item is not like the other items listed above. This is a handheld device that you can liken to a hair diffuser. But instead of releasing air, it releases steam that you can then direct right to your curls. What makes it stand out is its set of spiked nozzles which makes it somewhat similar to a diffuser. These shoot the steam directly on your curls. With its design, it really helps get the steam in between the tight coils of your hair strands so you can effectively steam your tresses. This patented hair appliance is classified as a styling and treatment tool because it doesn’t just help add moisture to your locks. It also comes in handy in detangling, volumizing, reshaping, and stretching your locks. With these, it’s practically the most efficient hair appliance out there since it doesn’t just help improve the quality and health of your locks but it can also do so while styling your tresses. A lot of people also say that it can really come in handy if you like to refresh or style your afro. This gives it more functionality as it proves to be a very handy hair care and styling device for folks with natural and curly tresses. The only thing that you need to note about this product is that it’s best to use distilled water with it. Don’t use water from the tap as it can mineralize and make your unit stop working. Regular cleanings are also recommended to clear its air passages.